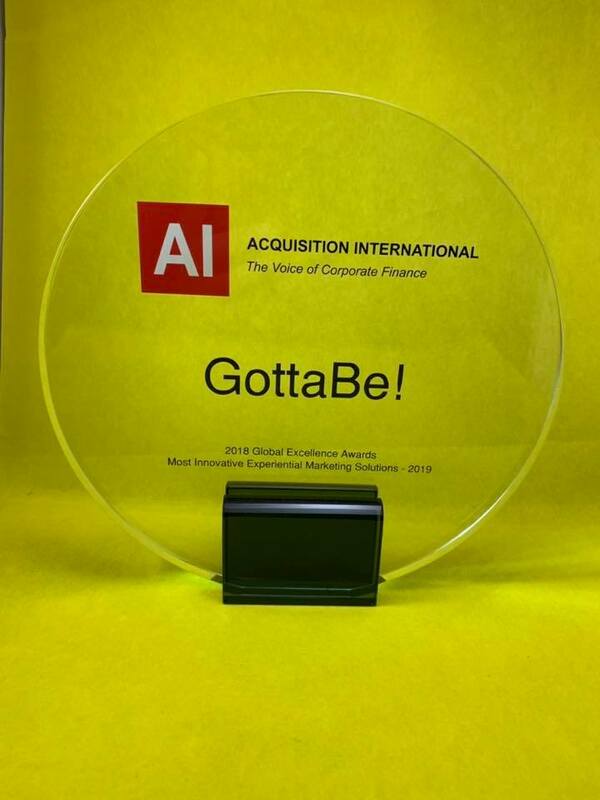 Awards mean a lot to us, here at GottaBe!. Our team put so much hard work, heart and soul into creating unique campaigns for you, that when someone recognise this, it makes is all very proud to be part of the team. That is why we couldn’t be happier that we have another one. What a great way to kick off 2019! The work that we have planned for this coming year is exciting to say the least, so we hope that we live up to the award from the lovely people at ‘the voice of modern business’; Acquisition international. Based on AI’s comprehensive analysis and research, GottaBe! was picked to receive the 2019 Global Excellence Awards and won “Most Innovative Experiential Marketing Solutions”. Tomasz Dyl, Managing Director of GottaBe! said: “We’ve turned 10 last year and we had a great year. A number of new Clients choose to work with GottaBe! and delivered some of the best campaigns yet. Kicking off 2019 with an award means a lot to me and the team – it’s always great to start a year on a high“. Experiential marketing is our forte so we couldn’t be more thrilled to be recognised for innovation within the field. We are taking this award into consideration, going into 2019 and continuing to strive to reach new levels of innovation. We hope that you can join us on the way. If you’re looking for experiential marketing agency that can deliver then don’t hesitate to contact our team on +44 2380 634283 and find out how we can help you and your brand.